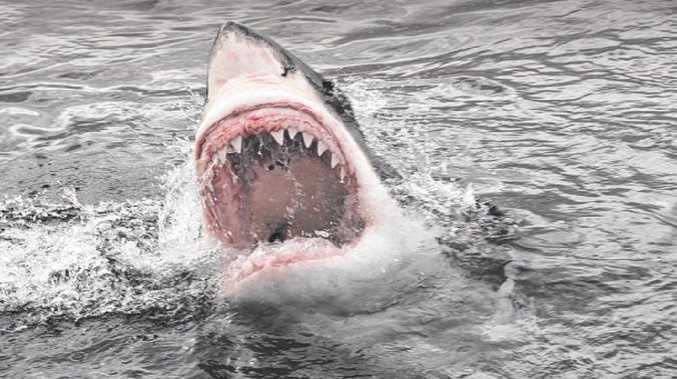 Australia has the highest number of fatal shark attacks in the world, new analysis has shown. 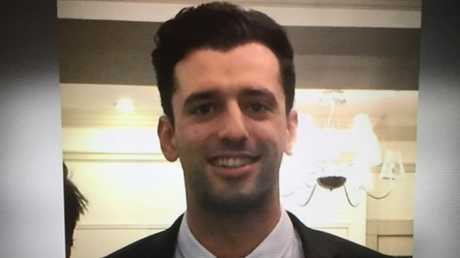 Cid Harbour shark attack victim Dan Christidis was killed earlier this month — the third attack in the area in six weeks. 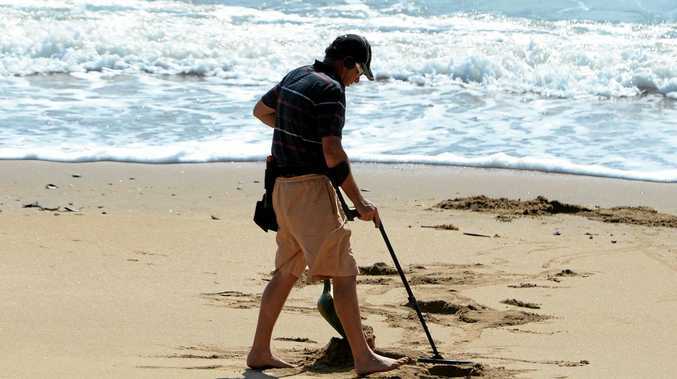 Fisheries Minister Mark Furner urged tourists not to swim in the area, while local tourism operators hit out at authorities in frustration, demanding more be done. But just how serious is the risk posed to those who venture into the ocean? "We looked at shark attacks and fatalities over a three-decade period and found there have been 47 deaths in Australia from 501 attacks," finder.com.au insurance expert Bessie Hassan said. 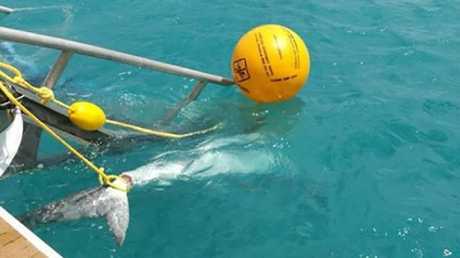 One of the Tiger Sharks caught at Airlie Beach after a spate of attacks. "The beaches around Byron Bay are the most prone to shark attacks, with 27 attacks in the past 30 years - three of which have been fatal," Ms Hassan said. "Nationally, the fatality rate over the past 30 years is 9 per cent." Interestingly, the country with the second-highest number of fatalities - the United States with 37 deaths - saw almost triple the number of attacks, with 1406 reported incidents. 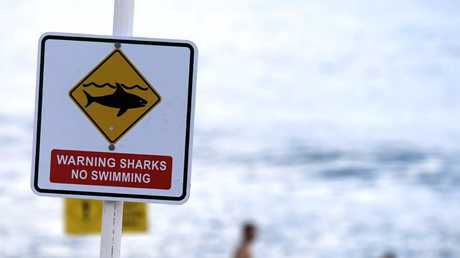 Shark bites in Australia lead to more fatalities than in the US, which records the most unprovoked attacks in the world. There, shark attacks account for an average of 0.6 deaths per year, compared to Australia where the average is 1.5 per year. That's despite the significantly lower number of reported attacks. So, why are our sharks deadlier? "In a way, Australia has a 'perfect storm' of conditions for serious shark attacks," says Blake Champman, research fellow at The University of Queensland. We live closer to the beach - 85 per cent of Aussies are within 50 kilometres of the coast - and spend more time there. International tourists flock to coastal areas, with 60 per cent of visitors spending the bulk of their time at the beach, Ms Chapman said. "And Australia has the world's highest diversity of sharks and rays, including roughly 180 of the 509 known shark species," she added. Of the 26 identified shark species that will attack humans unprovoked, 22 are found in Australian waters — including the deadly ‘big three’. 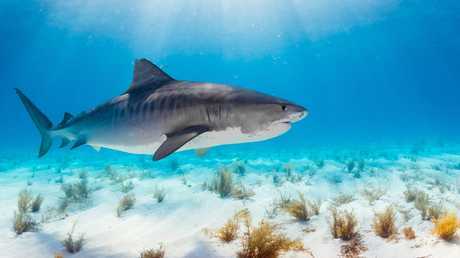 Scientists have so far identified that 26 shark species are prone to bite humans without provocation, although Ms Chapman said the number was likely to be higher. Of those 26 types of sharks, 22 of them are found in Australian waters - representing 85 per cent of the deadliest species. 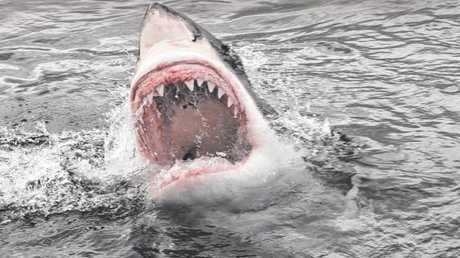 The "big three" deadly sharks are found in coastal waters - white sharks, tiger sharks and bull sharks, she said. "Taken together, it's clear that Australia's waters are home to three predators that can pose a real danger, even if only an accidental one, to humans. "But remember that shark attacks are incredibly rare events, and fatal ones even rarer still." A research paper published in 2016 looked at attack hot spots around the world, including Australia, America, South Africa, Brazil and the Bahamas, to identify possible causes. The findings, published in the journal Ocean and Coastal Management, listed increasing human population, habitat destruction, changes in water quality and climate change. And the authors noted that shark encounters appear to occur in clusters. So far this year, there have been 18 reported shark attacks across Australia, with four each in Queensland, NSW and WA. On Saturday, a Sydney man taking part in a surfing lesson at Seven Mile Beach on the South Coast, was bitten on the leg and arm and had to be flown to hospital. A kayaker off Moffat Beach on the Sunshine Coast escaped a frenzied attack by a four-metre tiger shark. And the iconic Bondi Beach was closed on Wednesday after two separate shark sightings. When humans experience a close encounter with a shark - be it seeing one, being attacked or dying - it grabs people's attention. In 2017, Minnamurra high school Joel Trist swam into shark-infested waters near Kiama to save his critically injured friend Brett Connellan. The pair had been surfing when Mr Connellan was savaged. Putting aside the risk, Mr Trist rushed out to rescue him. Elyse Frankcom was severely savaged in 2010 while snorkelling off Garden Island in WA and later told of feeling herself inside the shark's mouth. Ms Frankcom required 200 stitches across two separate bite marks. The blockbuster film franchise Jaws terrorised generations of beachgoers with its gory and confronting representation of fatal shark attacks. Released in the mid-1970s and a staple of home movie nights through the next two decades, it has been widely attributed by researchers for instilling an unreasonable fear of the ocean. In 1991, another film was released delving into the heartbreaking risk of death posed by an animal. My Girl, starring Macaulay Culkin and Anna Chlumsky, was a coming-of-age drama and in the end, Culkin's character dies from an allergic reaction to bee stings. Those who've seen both films would almost certainly look at sharks more fearfully than bees. And yet, in Australia over the past 11 years, more people have been killed by bees, hornets and wasps - 27 in total - than sharks - 26. "You're also five times more likely to die in your bath tub than by a shark attack," Ms Hassan said. "And it's 580 times more likely you'll die in some form of transport accident than even be attacked by a shark in Australia." Between 2007 and 2018, there have been 1920 deaths as a result of accidental drownings, 22 fatalities involving dogs and 21 people killed when struck by lightning. A team of researchers at the University of New South Wales analysed the real risks of rare events and compared shark attacks and terrorism. The number of people mauled by sharks almost doubled between 2000 and 2009, compared to the previous decade. Similarly, the likelihood of terrorism attacks in Australia increased. Despite that, Dr Ben Newell, professor of cognitive psychology at UNSW, said these kinds of events were extremely rare and the worry expressed by Australians was "disproportionate". However, horrific, unimaginable and uncommon events stayed in our memories and could cloud rational comparisons, he added. Despite the low likelihood of a fatal shark attack, the horrific nature of them is behind the increased fear. For instance, you're much, much more likely to experience a car accident than a plane crash but one elicits a greater sense of fear because of how little it happens. One solution is for people to embrace something called "metacognitive awareness", Dr Newell said. "This is being aware of how cognitive processes, like memory, work when we try to think about and estimate the frequency with which things happen," he said. "This failure of memory to deliver representative samples of evidence suggests a need to think carefully, not only about the bias in memory retrieval, but also in the samples available to us in the world. "So next time you are at the beach and contemplating taking a dip, just think of the millions of swimmers who have never been attacked by a shark, and not the relatively few who have." 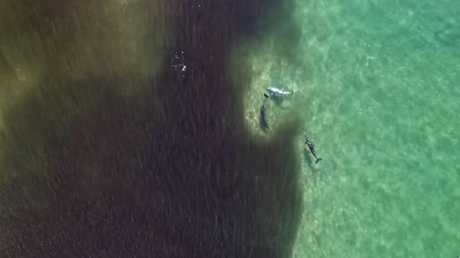 Authorities in NSW are trialling the use of drones to monitor shark activity before it poses a threat. Rarity aside, deaths from shark attacks do occur and the number of attacks has risen in recent decades. "Also, the stats are confronting," Ms Hassan said. "While it's incredibly rare it will happen to you, the stats don't lie - it can happen. There are people who spend a day at the beach and never come home." As a result, the public and private sectors are investing in ways to minimise risk. Last year, the NSW Government unveiled a $16 million shark management strategy, which included the use of new technologies to detect sharks. 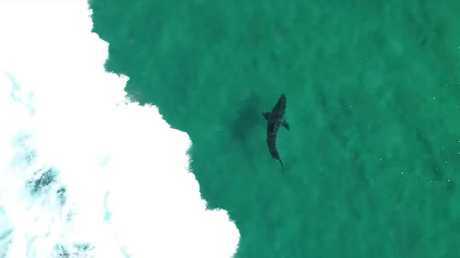 Drones are being tested as a quick and reliable way of spotting the animals before they pose an immediate risk and feedback vital information to authorities on the shore. The overall goal is to develop totally autonomous drones that can run continuous detection missions. In the Whitsundays in the past two months, after the three worrying attacks at Cid Harbour, a growing chorus of locals have demanded nets and drum lines be more widely deployed. Experts are split though on how effective they are in mitigating the dangers posed by sharks. Nathan Hart, associate professor of biological sciences at Macquarie University, wrote in 2016 that nets were controversial because they were designed to kill sharks and could also injure or kill non-threatening animals. "However, there are also substantial economic and logistical constraints on deploying nets at all locations where people might enter the water," Mr Hart said. "In addition to shark nets, shark-proof barriers and early warning systems can be used as large-scale initiatives to reduce shark attack risks at popular beaches." Swimmers and surfers can also take precautions to reduce their risk when in the ocean. Swimmers and surfers can take their own precautions to reduce the likelihood of incidents, Ms Hassan said. "Dawn and dusk are known periods when sharks are most active so it's best to avoid swimming or surfing during those times," she said. "It's an obvious one, but it's strongly recommended that people swim and surf at patrolled beaches only. 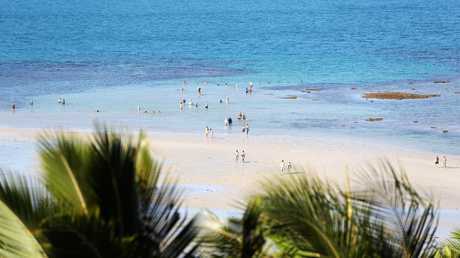 "Avoid swimming after large periods of rain in polluted waterways, at river mouths or estuaries. Watch out for large schools of fish, particularly bait fish, because sharks like to feed on them."